Peter Wirth is the owner of Mercedes-Benz of Springfield. The dealership opened the doors of its brand new facility in October 2017 at the end of 291, exit 6 on the Mass Pike on the land formerly occupied by the Plantation Inn. Prior, he was General Manager of Mercedes-Benz of Nanuet based in Rockland County, New York. 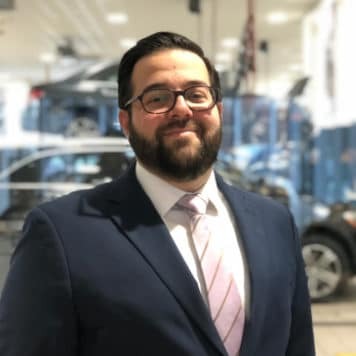 Peter spent 8 years in retail working as a salesperson, sales manager and then General Sales Manager of Mercedes-Benz of White Plains prior to joining the team in Nanuet. 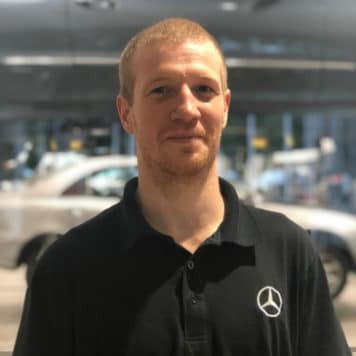 Always having a passion for Mercedes-Benz, Peter was born and raised an hour from Stuttgart, Germany, the birthplace of the automobile and the global headquarters of Daimler AG. He has a Masters Degree in International Business, Marketing and Finance from the University of Mannheim. 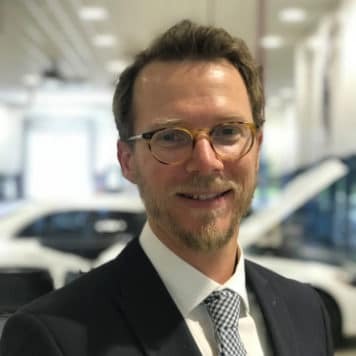 He started his career in the Product Management department at Daimler HQ and held positions in Communications and Marketing before moving to the US and beginning his career in automotive retail. Peter is married with four children and currently resides in Springfield, MA. Michelle and her husband own Mercedes-Benz of Springfield. She is responsible for the Marketing, PR and community outreach…Peter does everything else. 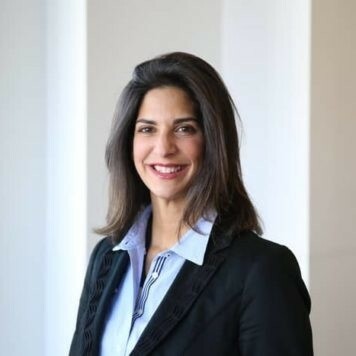 She also leads the automotive industry marketing efforts at Quantcast, and her quest is defining what it means to apply artificial intelligence and machine learning to help brands grow in the AI era. 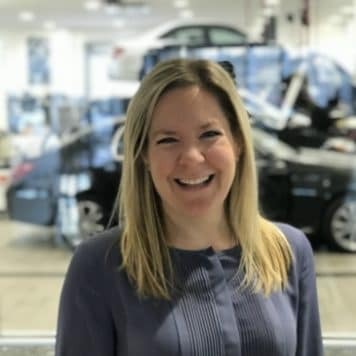 After a 15-year career with Mercedes-Benz USA, Michelle founded a marketing consultancy and focused on retail marketing. 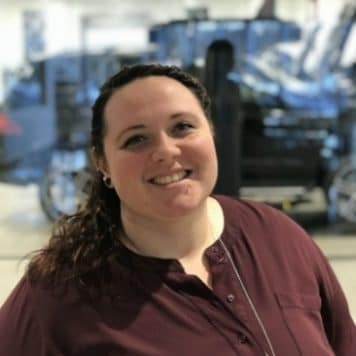 At MBUSA, Michelle held positions in engineering, public relations and led the team responsible for producing and placing Mercedes-Benz integrated marketing campaigns. Michelle was awarded BusinessWest 40 Under Forty (2018), Working Mother of the Year (2015) by the Advertising Women of New York and Working Mother Magazine. She is an active member of the Association of National Advertisers (ANA), serving on various committees – most recently, the Media Leadership Committee since 2010. She is a current Trustee of the Board of Directors at Bay Path University in Longmeadow, MA. She speaks three languages, is married and has three boys and a baby girl. Dana grew up in Derry, New Hampshire. He played basketball in both high school and college. He attended Lesley University in Cambridge, MA and received a degree in Business Management. Dana has been in the auto industry for 9 years, all of which as a Manager (Finance, New Car and Used Car). He has lived in Brighton, MA for the past 7 years and has just relocated to Hadley MA with his wife, 3-year-old daughter Olivia and best friend, his dog Chesney. Justin has been a finance manager for the last 13 years. He is originally from Enfield, Connecticut and now lives in Longmeadow with his son Jackson and wife Kimberly. In his free time you can find him golfing or watching hockey. Justin is a huge New England sports fan and loves going to watch the Patriots or Bruins play. 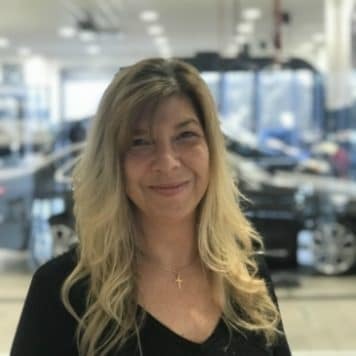 Christine has been with Mercedes-Benz for over 17 Years! She originally worked for Mercedes-Benz Corporate in northern New Jersey. From there she relocated to Mercedes-Benz of Nanuet in New York and fortunately she’s now here in Springfield with us! Christine is originally from New York but moved to Enfield Connecticut in August 2017 to be closer to work. Christine enjoys watching Formula 1 racing, soccer, and spending time with her family. Christine loves working for MB of Springfield because of the family-friendly atmosphere. Dave worked for Balise Ford and Curry Nissan for the last 9 years but says he enjoys working with Mercedes-Benz better than any other brand. originally, Dave is from Somers, Connecticut but 3 years ago he moved to Ludlow, Massachusetts. Dave studied business management at UCONN and has a minor in accounting. When Dave isn’t selling cars, he enjoys going to sporting events with friends and traveling. His favorite part about working for MB Springfield is selling quality vehicles to the local community. Prior to starting as a sales consultant here, Dave owned Wilbraham Auto Sales for 35 years. In his spare time, Dave enjoys traveling with his family, photography and watching Formula 1 racing. Dave has been local to Western Massachusetts his entire life. He moved to Wilbraham when he was 6 years old and has been there ever since. Dave enjoys working for MB of Springfield because of the transparent business practices and selling the best vehicles in the market. Jim has had other experience in the automotive industry with dealerships such as Lexus and Volkswagen. Growing up, Jim moved all over the country and has lived in Maine, Florida, Washington D.C, New Jersey, etc. As of now he lives in Easthampton and enjoys deep sea fishing, mountain biking, and spending time with his daughter BrieAnna. Jim mostly enjoys working for MB of Springfield because of the family orientated atmosphere it has, with customers and coworkers. This is Gary’s first job in the automotive business. Gary is originally from Scotland and moved to Utah in 2009. He would spend winters in Utah snowboarding and working at a local ski resort and would spend summers in Nantucket getting away from the cold. Gary recently moved to Longmeadow with his one-year old son Forrest, and wife Danielle. Although Gary is new to the area he enjoys hiking local trails and going to public parks near his home in Longmeadow. Gary’s favorite aspect about working for MB of Springfield is meeting new people and learning about new technology. 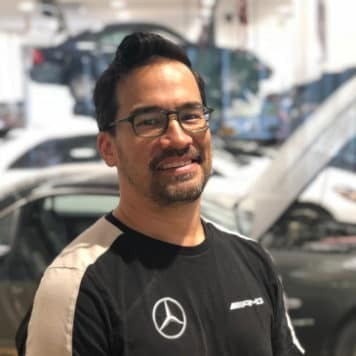 Ricky was one of the first employees at Mercedes-Benz of Springfield when it first opened in October 2017. 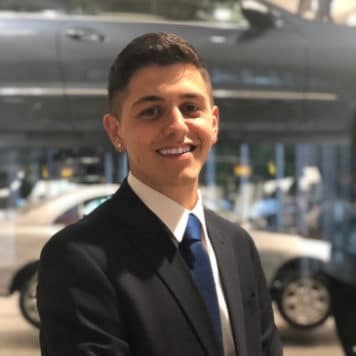 Ricky started here as a valet and is now selling cars. Did we mention he’s only 19? 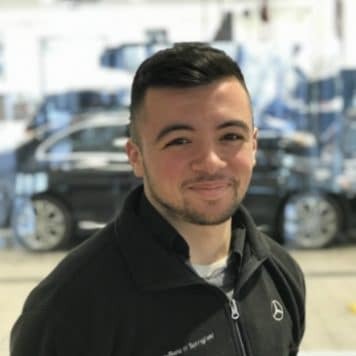 While working for Mercedes-Benz of Springfield, Ricky has obtained a new-found knowledge and understanding of the automotive business. Ricky has lived in East Longmeadow his whole life and in his free time he enjoys spending time in Cape Cod with his friends. Ricky enjoys working for MB of Springfield because of the atmosphere and experience it provides. 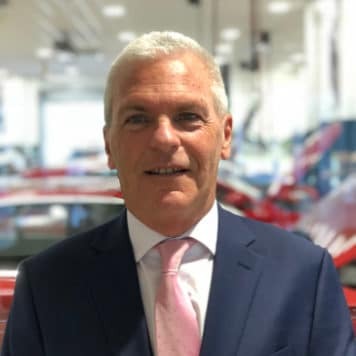 Jack has been in the automotive sales business for over 20 years. He is originally from Rhode Island and now lives in Westfield with his wife and four cats. 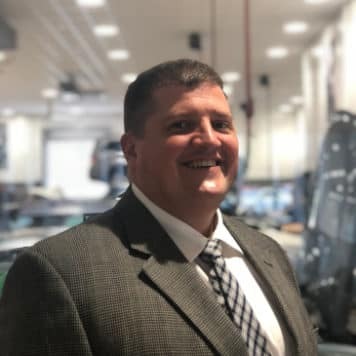 Most of his sales career has consisted of selling Freightliner trucks and BMW, but he’s excited to now be working with Mercedes-Benz of Springfield. Jack attended Roger Williams University and has a bachelors degree in computer science and management. When Jack isn’t selling cars you can find him doing charity work with “Good Deed DJ” or just DJing on his own time. Jack says he enjoys working for Mercedes-Benz of Springfield because the culture Mercedes-Benz creates is so far ahead of the curve. Anita has been in the automotive industry for over 20 years! When she’s not working you can find her in her garden at home or walking her dogs. Anita is originally from Palmer and attended college in Montreal and continued to live there for 10 years before coming to live in Hampden Massachusetts. Anita enjoys working for MB of Springfield because of the professional manner and family-oriented environment it provides. Prior to working for Mercedes-Benz of Springfield, Rich retired as an executive for the U.S Postal Service after 36 years. 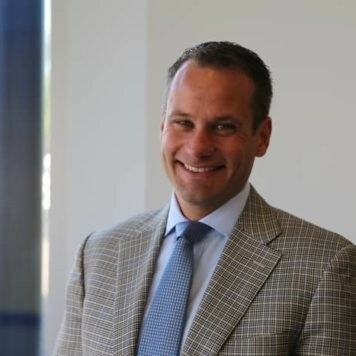 He is originally from Ludlow, MA and has lived/worked in Memphis, D.C, Connecticut, and Boston. Rich enjoys spending time with his wife, Sheila, three kids, five grandchildren, and great-grandchild. 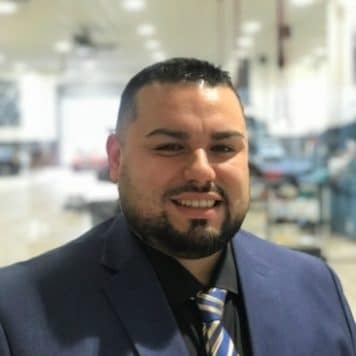 His favorite part about working for Mercedes-Benz of Springfield is the way management treats its employees and customers, they really do make it personal. Bill has been in the automotive service industry for the past 38 years. Majority of the time has been spent working with German vehicles. Bill was raised loving cars and motorcycles and felt that working with them was the right fit from a very early age. In his free time, he enjoys riding and restoring motorcycles and spending times with his family and dogs. Bill enjoys working at MB of Springfield because he was given an opportunity to hire people with the same vision as himself and loves the people he works with. Scott grew up in Virginia and now lives in Westfield with his two sons and wife. He has been in the service industry for over 20 years and has loved every second of it. When Scott isn’t at work you can find him watching his sons playing sports or just spending quality time with his family. 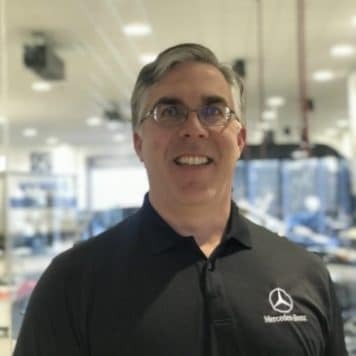 Scott said he couldn’t pick his favorite part about working for Mercedes-Benz of Springfield but he did mention the great environment, impressive ownership, and quality product as a few reasons. Prior to working here, Felicia was a service coordinator at Lia Toyota of Wilbraham. 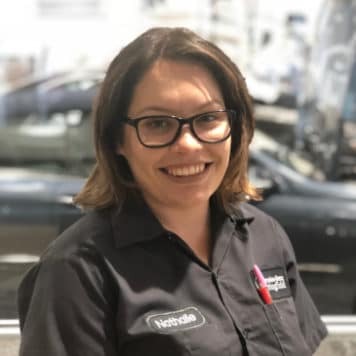 Felicia enjoys the service aspect of the automotive industry because of the help she gives customers with their vehicles. In her free time, Felicia enjoys photographing scenery and hiking to scenic areas, especially Tannery Falls. Felicia grew up in Chicopee and has lived there most of her life. Her favorite part about working for MB of Springfield is the customer service environment and working with luxury vehicles. Jen has been in the automotive industry for over 20 years! She currently lives in Springfield with her two kids Dylan and Cassidy. In her free time, Jen can be found on the softball field or binge-watching rom-com, drama, or action movies. 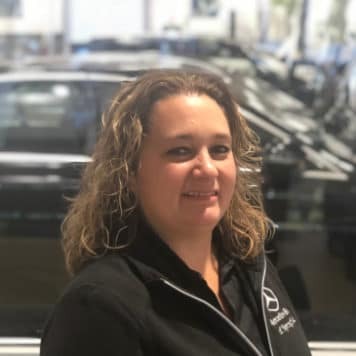 Jen says she enjoys working for Mercedes-Benz of Springfield because of the experience it provides and the family feel it constantly gives off! Dave retired from the Commonwealth of Massachusetts after 30 years. After retirement he realized he still had a drive to work hard and that’s how he ended up here! Dave is originally from Springfield but now lives in Longmeadow with his wife of 25 years, Carmela. Dave enjoys vacationing in Florida and spending time with his two children, Steven and Andrew. Dave enjoys working for MB of Springfield because of the fun environment it creates. Dalton has lived in Chicopee his whole life and is in his second year at HCC where he is studying business management and plans to attend a four-year school to receive his bachelor’s degree. Dalton has always been a car enthusiast and when MB of Springfield was hiring he jumped at the opportunity. Dalton enjoys going to the gym, hanging out with friends, and going to car shows. 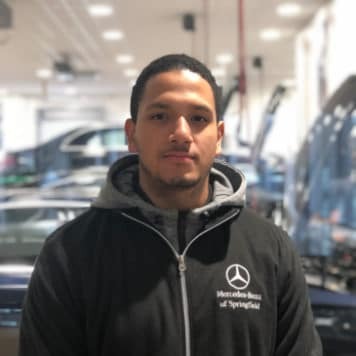 His favorite part about working at MB of Springfield is the opportunities it has given him being 19 years old and being able to work with luxury vehicles. Bernie has lived in Springfield most of his life and is a retired U.S Postal Service employee. 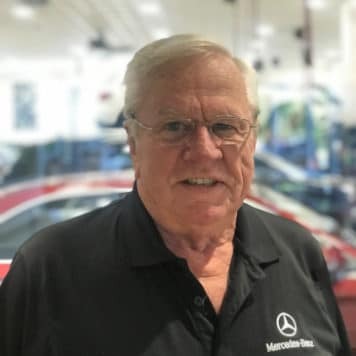 After retiring Bernie realized how much he loved working and found a job with us here at Mercedes-Benz of Springfield! Bernie enjoys spending time with his two kids and three grandchildren. 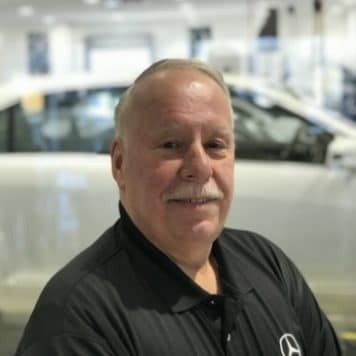 Bernie enjoys working for Mercedes-Benz of Springfield because of the luxury vehicles and atmosphere. Brandon is one of our Master techs here and has over 12 years of experience in the automotive industry. He is originally from Pittsfield, MA and now lives in Chicopee with his girlfriend Jill. Brandon went to the Universal Technical Institute in Phoenix, AZ. 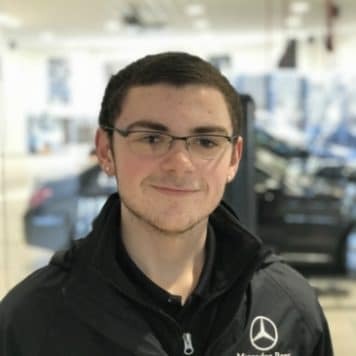 Brandon loves working for Mercedes-Benz of Springfield because from the beginning he felt as if he has helped it become what it is today. Corey has always loved working with cars and grew up with his cousins teaching him about them. It was a no-brainer that he wanted to work in the automotive technician field. Corey studied at Porter and Chester and became a certified technician a few months ago. He has lived in Ludlow most of his life and enjoys spending time with family and friends. 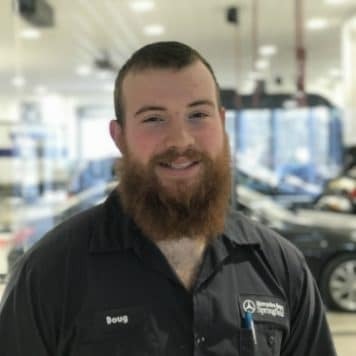 Corey’s favorite part about working for MB of Springfield is the opportunity to work with high-quality vehicles at 20 years old. Doug is originally from Ware but now lives in Belchertown with his wife Audrianna and two daughters, Quinn and Everly. 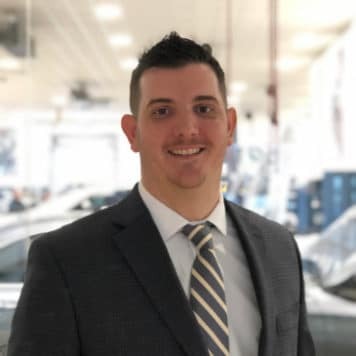 Doug has over seven years of experience in the automotive industry. 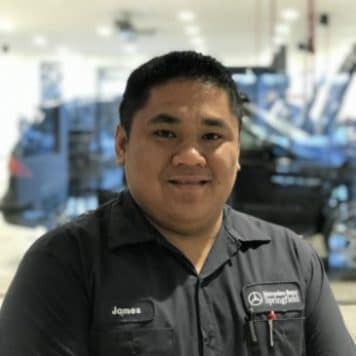 He enjoys spending quality time with his family and friends and enjoys working for Mercedes-Benz of Springfield because of the family atmosphere. Edgar is originally from Holyoke but now lives in Chicopee with his wife and daughter, Ariana. Edgar went to school at Porter and Chester Institute and has been working with cars for a little over two years. 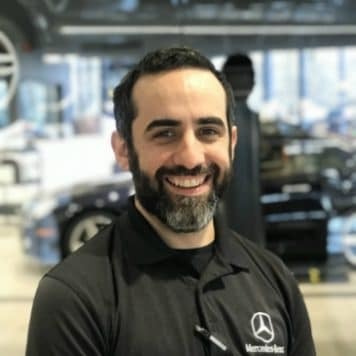 He enjoys working for Mercedes-Benz of Springfield because of the experience and atmosphere it provides. 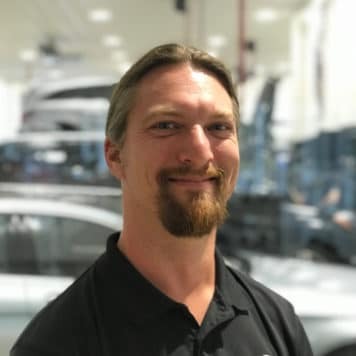 James is one of our Master techs here and has over 13 years of experience in the automotive industry. He currently lives in Connecticut and when he isn’t working on cars you can find him admiring them at different car shows across New England. 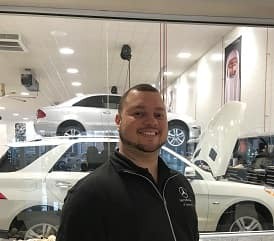 James favorite part about working for Mercedes-Benz of Springfield is being able to work alongside great people in a good atmosphere. Tyler currently lives in Ludlow with his girlfriend Kaleigh and son Easton. He has over 14 years of experience in the automotive industry and received his schooling at Pathfinder. In his free time, Tyler enjoys spending time with his family outdoors. Tyler enjoys working for Mercedes-Benz of Springfield because of the environment it provides every day. 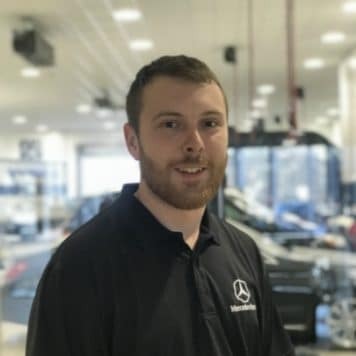 John has almost 8 years of experience within the automotive industry, seven of which were with Mercedes-Benz where he is a Master tech. He is originally from Norwood, MA and now lives in Holyoke. John has a degree in Horticulture from UMASS Amherst and realized he was more interested in the automotive industry. 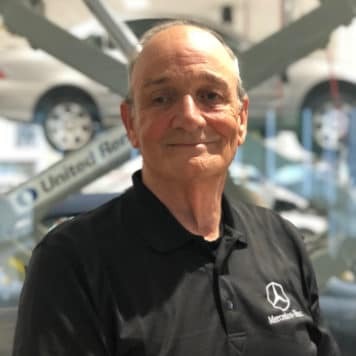 John enjoys working for Mercedes-Benz of Springfield because of how management cares for its employees and customers. Greg is originally from Westfield and now lives in Stafford Springs, CT with his two sons Bode and Simon. 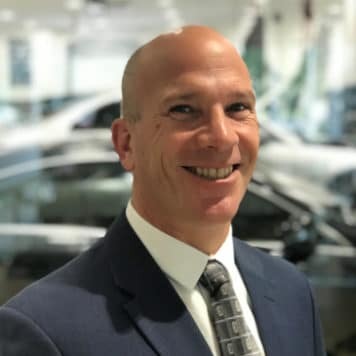 Greg has over 22 years of experience in the automotive business, five of which were with Mercedes-Benz. Greg enjoys spending time outdoors with his two sons. 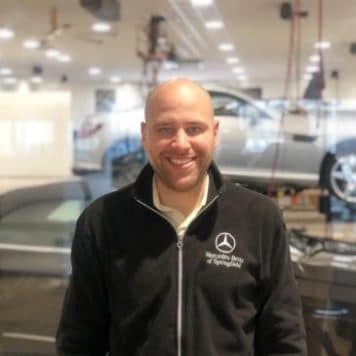 His favorite part about working for Mercedes-Benz of Springfield is the team environment it focuses on. Corey lives in Enfield, CT with his wife Sherri, son Parker, and dog Eli. Corey has almost 20 years of experience in the automotive industry. In his free time, he enjoys spending time with his family including coaching his son’s little league team. 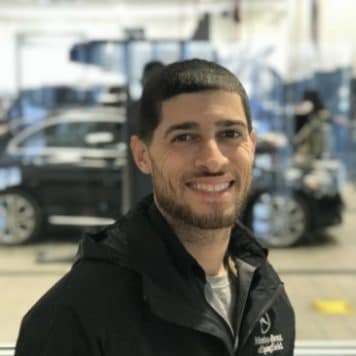 His favorite part about working for Mercedes-Benz of Springfield is the way that everyone here feels like a family which is unlike other dealerships he has worked for. Jacqueline was also born in Germany and moved here when she was two years old with her identical twin sister Nathalie. She lived with her sister in Danbury CT and recently moved to Chicopee MA to be closer to work. Jacqueline also studied at Lincoln tech and graduated last year. 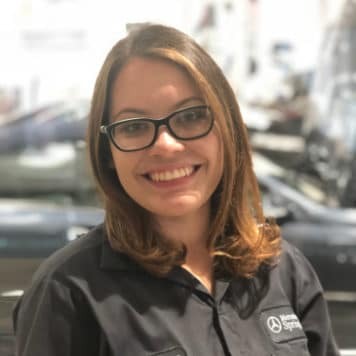 Jacqueline loves working for Mercedes-Benz of Springfield because of the people and experience it provides. Nathalie was born in Germany and came to the United States when she was two years old. She is originally from Danbury CT and recently moved to Chicopee MA to be closer to work. She lives with her identical twin sister Jacqueline and they are inseparable. Nathalie studied at Lincoln Tech in CT and graduated last year. Nathalie says she enjoys working for Mercedes-Benz of Springfield because of the family environment it provides. 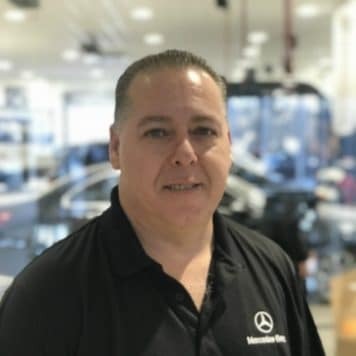 Dave has over 20 years of experience working with the Mercedes-Benz brand. He says he’s been with it for so long because “Nothing beats a Benz!”. Dave is originally from Connecticut and still lives there now with his wife, 8-year-old daughter Lily, and 6-year-old son Zach. If Dave isn’t at work you can find him spending time with his family outdoors skiing, canoeing, or camping! 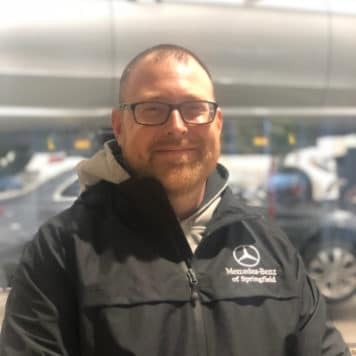 Dave enjoys working for Mercedes-Benz of Springfield because of the quality vehicles he handles every day and the challenge working with them provides. Joe is originally from Springfield and now lives in West Springfield. He enjoys spending time with his two kids and two grandchildren. 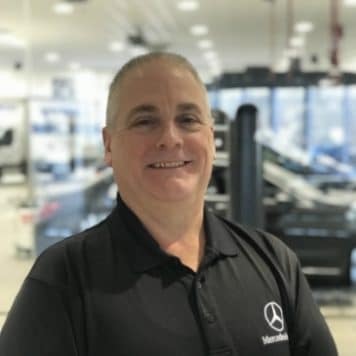 Joe has over 30 years in the automotive parts industry and enjoys working for Mercedes-Benz of Springfield because of the atmosphere it provides. Tom has over 20 years of experience in the parts industry! He is originally from Springfield and now lives in Chicopee. He enjoys spending time with his three daughters, Brittney, Kelie, and Cassie. When Tom isn’t working you can find him adding pieces to his vintage stereo collection. 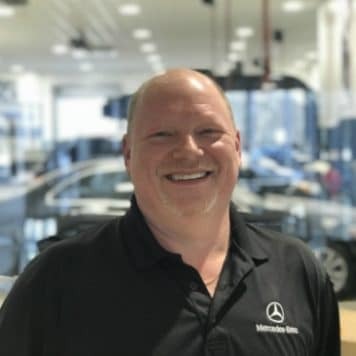 Tom enjoys working for Mercedes-Benz of Springfield because he works with such a great staff and has fun every day! 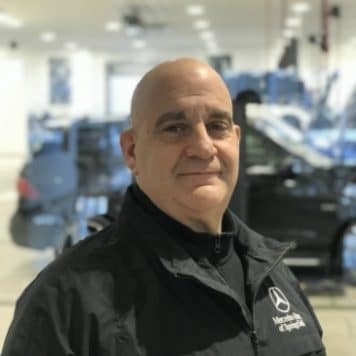 Before coming to Mercedes-Benz of Springfield, Harold was a corrections officer for 23 years. After retirement, he realized he wanted to continue working and landed a job with us! Harold has been a Mason and Shriner since 2006 and rides for Iron Horse during the Christmas season. Harold enjoys riding motorcycles and visiting his two children in Florida with his wife of 5 years, Maureen. Harold enjoys working for MB of Springfield because of the atmosphere it provides being family owned.